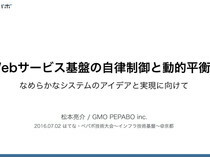 松本亮介 / GMO PEPABO inc.
報処理学会論文誌，Vol.55, No.11, pp.2451-2460, Nov 2014. Virtually at Each HTTP Request, RubyKaigi 2014, Sep 2014. IEEE transactions on Knowledge and Data Engineering, pp.482-492, 2006. ※1 松本亮介, mruby-changeﬁnder, https://github.com/matsumoto-r/mruby-changeﬁnder, 2016年3月. 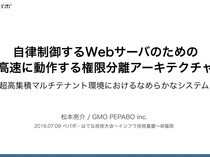 ※1 松本亮介, トラフィック特徴量の相関特性を用いた異常検出, 平成19年度 卒業研究発表会, 2008年3月. ※1 W.B. Cannon, The Wisdom of the Body , (1932) W.W. Norton & Co., New York. ※2 Schoenheimer, Rudolf. "The dynamic state of body constituents." The dynamic state of body constituents. (1946). ※3 福岡 伸一 (2007), 生物と無生物のあいだ, 講談社現代新書, 2007年5月. 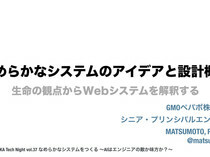 Data Center." NSDI. Vol. 11. 2011.